The MEK market is expected to register a CAGR of 4.25% during the forecast period, majorly due to the increasing demand for paints and coatings, owing to various constructional activities across the globe. Investments in the transportation sector in China have increased over the past few years. China’s transport ministry and National Development and Reform Commission (NDRC) had planned to invest USD 724 billion between 2016-2018 for constructing 303 key transportation projects, which include railways, highways, waterways, airports, and urban rail. The construction industry in Qatar is forecast to experience high growth, as the government spent USD 200 billion in 2017, as part of major infrastructure investment scheme, resulting in increased demand for paints and coatings. 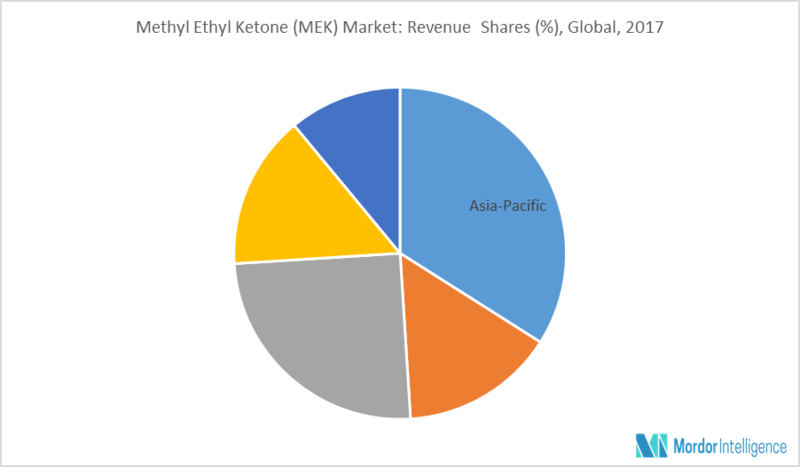 This high growth in infrastructure, automotive, and industrial activities is expected to drive the growth of the MEK market. The global construction industry growth has stabilized in 2016, upended at 2.4%, though the market is expected to improve over the next few years at an average growth rate between 2.8 - 3%. The expected economic growth of the major economies is likely to reflect its positive trend on almost every essential industry. The US construction industry is likely to project relatively stable growth over the forecast period, braced by the upswing in the residential sector. Reflecting the extent of the downturn in the United States in real terms, the construction industry is expected to return to the pre-crisis level by 2021. The Eastern European construction industry is expected to be relatively weak over the forecast period, compared to other regions in the world. However, with growth in the construction sector, the demand for MEK is expected to increase accordingly. In 2017, Asia-Pacific was the leading consumer of market, followed by Europe and North America. The demand in Asia-Pacific primarily driven by demand of paints & coatings by construction and manufacturing sectors. Increasing construction spending by governments particularly in India and China to meet the rising infrastructure needs has been driving the construction industry growth which in turn is anticipated to drive demand for adhesives, printing inks, plastics, paints, and coatings demand. April 2017: ExxonMobil Chemical Company expanded the capacity of its global hydrocarbon fluid assets by more than 250,000 metric ton per year, at its world-scale petrochemical sites in Antwerp, Belgium; Baytown, Texas; and Jurong Island, Singapore. Major Players: Arkema S.A., ExxonMobil Chemical, Shell Chemicals, Maruzen Petrochemical Co. Ltd, and Sasol Solvents, amongst others.